Confession time, I’m awful at the command-line. Used to waste nearly an hour every week either mistyping or looking up Terminal commands for common development tasks. That was over a billable week a year lost. Not anymore, I’ll show you how I use Terminal aliases to increase productivity on the command-line and improve workflow. Terminal aliases are shortcuts for longer commands. Here’s an example of how using them has saved me a lot of time. Pretty easy to remember right? I forget this command all the time despite using it nearly every week. What I want to do is type in something simple like flush_dns instead. Here’s how I do it. Next look for any hidden files resembling .profile or .bash_profile. 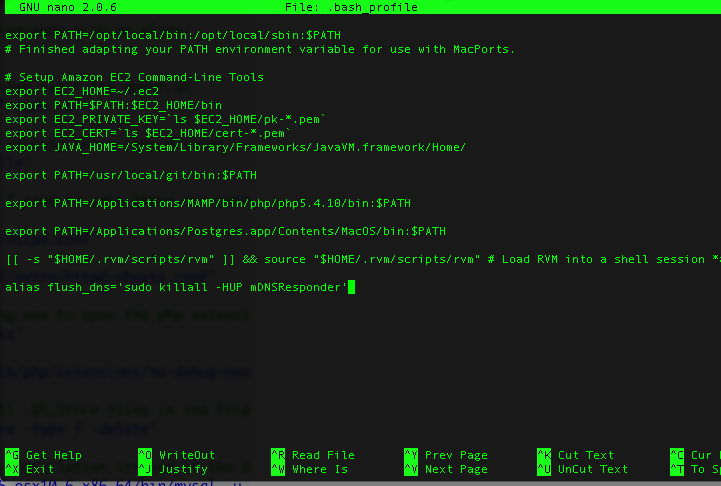 Next I open up .bash_profile for editing. Then I just load Terminal so it will recognize the new alias. Nice! No more looking up that stupid command, Terminal does it for me. It even makes sure that it has the sudo command before it. Speaking of sudo one thing I run into constantly is forgetting to add it when I modify a system file, like /etc/hosts. Easy enough with an alias. I can create a command called “edit_hosts” which will do that for me. While I’m at it, why not add a shortcut for editing the profile and reloading it? Also how about php’s config file? Finally the next big thing I always run into is compressing and uncompressing folders & files. I can never remember the tar commands to do it. Now I can just call pack and unpack. These are just a few ideas for terminal aliases you can use, they work for me. But the important thing is you can customize the aliases to fit your workflow, your system. Terminal aliases are just one tool you can use to start making your tools work for you instead of against you. Got some cool aliases you’ve used? Let me know in the comments!